Remote sensing is being used more and more to monitor illegal activities. For example satellite imagery is being used to catch illegal poaching of animals in Africa. Many of these projects are remotely sensing through satellite imagery. Rainforest Connections has thought of another way to observe a location remotely. This is through audio. 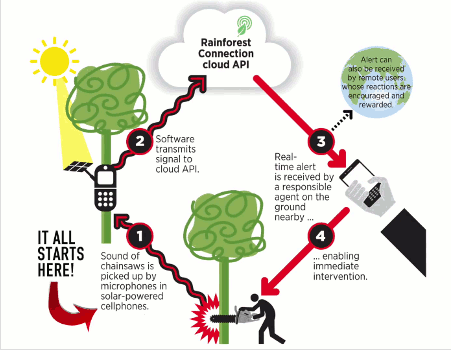 Rainforest Connections takes old smartphones, wires them to solar panels for power, and attaches them to trees in the rainforest. This audio is listening for chainsaws. Most of the deforestation in the rainforests around the world is illegal. This means that a huge contributor to climate change is being caused by illegal actions. By attaching these cell phones high up in trees, they can detect the noise of chainsaws, and report when people are logging in areas where it is illegal. This technology allows responsible agents to come to the site of the action and stop the perpetrators in the act. This will help save lots of trees that would have been cut down due to lack of knowledge of the event, or not knowing until after the fact. Rainforest Connections is striving to minimize climate change, mass extinctions, and illegal actions by upcycling old cell phones.